Cherdo on the Flipside: Review: Snack Girl to the Rescue! 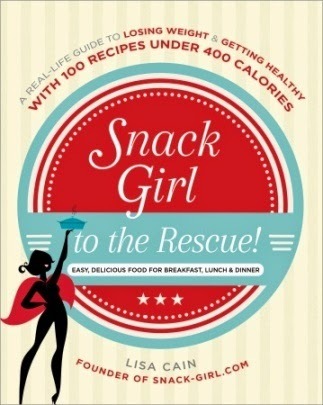 Blogger Lisa Cain ("Snack Girl"), founder of Snack-girl.com, has come up with a combination of information, inspiration, and delicious options in her new book, Snack Girl to the Rescue! Easy Delicious Food for Breakfast, Lunch & Dinner. The cover described the book as "a real-life guide to losing weight & getting healthy with 100 recipes under 400 calories." I was anxious to read Cain's view on the diet-o-rama of weight loss and maintenance. Loved the book; loved her website! Allow me to inject my tale here, before I proceed. Needless to say, one of the reasons I picked Lisa's book to review is my long standing problem of being short for my weight. Under no delusion that she could make me taller, I dived into it, chapter by chapter. I'm not sure if you'd call it a quick read, but I definitely went through it in a flash. Beginning with a brief biographical sketch, Cain told of her journey, pre-snack girl; it was nicely paced. Not too much quantity in the information department; it was pure quality, in a comfortable conversational style. I laughed out loud and totally loved her comment: "My love affair with Food is a long one and I didn't want to change it. We are so good together." Immediately, I felt like Lisa Cain was sitting at the table chatting with me. The cover claims were true! This book is a real life approach. I held in my hands a workable alternative to just starving; hallelujah! No smoke and mirrors, just get real with your diet and lifestyle. From there, Cain jumped into a section on Encouragement and Guidance, touching on the issues dieters know so well: prepackaged, diet cleanses, fasts. The Diet Bogeyman Approach talks about lessons learned from the top "bogeyman" diets - popular, science based diets that are very nearly unsustainable long term. Been there - more than once. In a very practical approach, she advises the reader to learn something from each, such as "more protein helped you stay full," but remember that a plan you can't sustain won't work long term. Some of the other sections address Healthy Cooking, Emotional Eating, and Exercise. As Cain dissected the different types of emotional eating and scenarios that trigger that behavior, I knew she spoke from experience. She shared a heart wrenching story of the loss of a beloved aunt and how her daily activities, from getting up to child care, came to a halt. On that low point, the author remarks, "Take time to love yourself, find ways to heal, and allow yourself to be a mess...you can get back to being healthy when the worst of your pain and sadness is over." The second half of the book is all about food and recipes, and you proceed with a last dose of helpful advise on things you never consider till you're standing in the supermarket with a puzzled look on your face: understanding the nutrition facts box, The Do-I-Buy-It cereal test, and buzz words are particularly useful. The list of recipes by "calories per serving" was really helpful. Cain also includes Five Pantry Meals plus a shopping list to make Cocoa Chili, White Chili, Simplest Comforting Pasta, Stovetop Tuna Casserole and Broccoli, Potato, & Cheese Chowder. The recipe that might be an instant staple for us (and by us, I mean me) is called A Green Smoothie That Doesn't Taste Like Grass. Like the author, I don't trust any of the green smoothies, but this one won me over. It couldn't be simpler: 1 cup frozen mixed berries, 1 cup loosely packed fresh kale leaves (stems torn off) and 1/2 banana and 1 cup of water. Plop it in a decent blender, blend till smooth, and you'll have two servings that come in at 156 calories each. Mighty Meatloaf and Sneaky Zucchini Lasagna are in my future (Shhh! Don't tell the men...). Good info here, dear friend! As I told you in the previous post, I'm a little over six feet tall and most of my life I was blessed with a calorie burning metabolism and could eat tons of food and never gain an ounce. I was even a little under weight at one point and resorted to buying those rapid weight gain powders they sell at the fitness centers. Now that I'm older it's become much more difficult to keep unwanted pounds off. Fortunately, Mrs.Shady loves smoothies, loves to tweak combinations of healthful ingredients, and makes two or three large batches per week. I love fish and merely tolerate white meats. If it was up to me, I'd never eat red meat again but she insists. I wish you a safe and happy weekend, dear friend Cherdo. Please take good care of yourself and know I'm thinking about you! Shady, we've known each other for centuries. It's a good thing. In your honor, I'm swigging a big class of diet water right now! How brilliant that the diet gurus finally figured out that the perfect smoothie has no fruit or vegetables, just liquid. A toast...to all the bread I can't have, toasted or otherwise! You are in a good geographical location to have access to great fish; moving closer to the coast would probably work like an instant diet because I could eat seafood for every meal, no problem. When we vacation, I joke that I'd eat fish oatmeal for breakfast, if it was offered. I love these cookbooks that sneak healthy foods into meals that taste good. I may have to check this cookbook out! Are there slow cooker recipes in there? She talks about slow cookers (pp.40-41), but there isn't a specific slow cooker section. Selfishly, I pick books to review that I think I might like. In all honesty, I love this book and I'm so glad I took the time to go through it. I knew nothing of Lisa Cain's other work before this; now I'm totally in fan mode. Easy, sensible recipes for day to day meals and snacks! No crazy ingredients or complicated prep. Love it. Healthy food has to taste good or we aren't going to stick to our plans, glad you have found something that makes sense. Quite like the sound of the lasagna. I just checked out her website, and I might try a couple of the snacks this weekend. Everything here is pretty solid advice. Yeah, I thought that, too. I've had enough crazy nutritional torture to last a lifetime. She sounds wonderful and the book sounds equal parts humor and good, helpful info. Great combo! I'm glad you got something out of it. I remember having banana smoothies many moons ago. Have a good weekend! Sounds like fun - a readable cookbook. I won't deny it. The idea of sneak zucchini makes me very nervous.